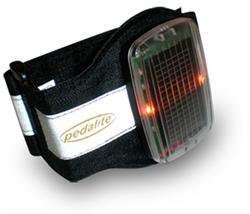 A unique and innovative solar-powered, lighting product worn around the arm or ankle to keep cyclists safe on the roads, protect children as they walk or cycle to and from school - also ideal for horse riders and joggers. A large unique floodlight module is attached to straps that fit comfortably around the ankle or arm with high visibility reflective strips on both sides as an additional feature. The lights shine brightly from every angle so cyclists, sports people and children wearing Anklelite will be seen clearly by motorists any time day or night. The lights can be turned on and off and set to different modes – flashing, constant or off. Buying this product will earn 128 Loyalty Points. Be the first to submit a review for the Anklelite / Armlite Solar Powered Safety Wear.